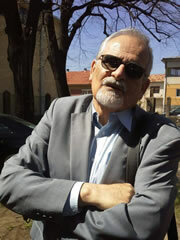 was a respected architect and conservator from Niš. In period from 1976. to 2004. he was a director, and in period from 2004. to 2008. deputy Director of the Institute for Cultural Heritage Preservation Niš. He retired in January of 2009. but continued to cooperate with the Institute. His career was a remarkable in many aspects and decades spent in the Institute were filled with continuous obligations, responsible and large-scale projects, which he performed with ease. As a real connoisseur of architecture and as manager, he received a number of awards. Besides the work in heritage conservation field (Restoration of the monastery quarters of Prohor Pčinjski - "Borba Award for Architecture"), he also proved himself as a designer of contemporary buildings ("Dušanov Bazar" and "Hilandarski metoh" in Niš). Opus of his work, without a doubt, puts him into the group of the most important, influential and prolific Serbian conservationists of all time.